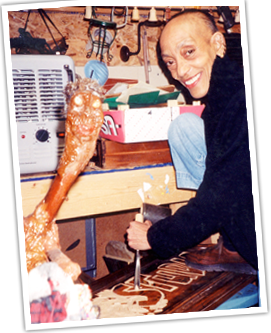 This database of Aminah Robinson's work is an ongoing project of the Columbus Museum of Art to document the artist's prolific output of paintings, drawings, prints, and sculptures. If you own work or know of work that is not in the database, please send us information in the "Add to Database" section on this homepage. For a brief overview of Aminah's life and work, click here. For more in-depth information, visit www.aminahsworld.org. Note: For works of art in the collection of the Columbus Museum of Art, enter "CMA"
Aminah has been making art for more than six decades. If you own a work of art by Aminah or know of one that is not in the database, please send us a photograph of it and tell us about it by completing the online questionnaire below. We will not knowingly disclose any information about persons contributing to this database. Share Aminah's work with your friends by sending personalized ePostcards featuring selected works by Aminah Robinson.